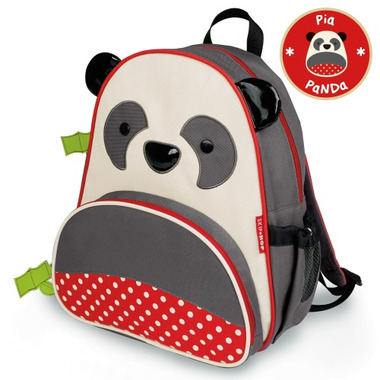 This Zoo Pack by Skip Hop is the little kid backpack where fun meets function! Whimsical details and durable materials make this the perfect on-the-go pack for on-the-go kids! Good quality and cute design. Great for my 2.5 y/o toddler's first year at school... I expect it will last into their second year too. They love this bag. Purchased this for my daughter for preschool. Very happy with it. Size is just right for a preschooler. Backpack is well made and sturdy. Not to mention the cute design. My daughter loves the backpack and brings it everywhere. Super cute. Good amount of space. Adorable zipper pulls. Durable material. Fits my 2yo well. Would buy again for sure. I bought this for my one-year-old daughter to use at daycare. It's the perfect size, and so adorable. Love it! I purchased this backpack for my 2 year old and she carries it around everywhere! It fits her perfectly and she loves the fact that its a bear. Well made bag! Great backpack for preschooler! Sturdy and roomy. My daughter loves this so much she wants to wear it all the time (even around the house).